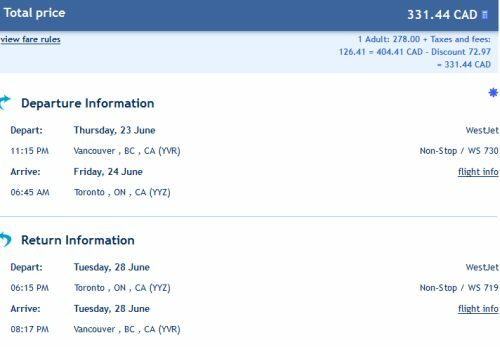 WestJet is showing a few flights from Vancouver to Toronto over the 2016 Victoria Day long weekend for $367 CAD roundtrip including taxes. The flights are non-stop. June 23, 24, or 25 to June 26 or 27 is also $367. Update: June 23 to June 28 is currently showing as $331 roundtrip. Look for the $160 flight on the way there, the 11:15 PM departure. vancouver, yvr, flight deals, westjet, toronto, ontario, yyz, canada and north america. 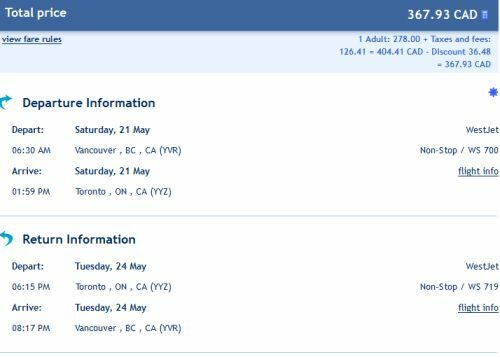 2 Responses to "Vancouver to Toronto over the 2016 Victoria Day long weekend - $367 CAD roundtrip including taxes"
The West Jet is now saying "Unfortunately, this Coupon Code is not valid for the day you want to travel." Tried for May 21 leaving YVR to return May 23 or 34 from YYZ. I think it's safe to say this one has expired.